Police must learn from past protests to avoid stoking further violence. I sat in stunned silence on Saturday as hundreds of local and state police did nothing to prevent assaults, brawls, and a murderous act of vehicular homicide in Charlottesville, Virginia. Backed up by armored vehicles, riot police stood rooted in formation, quietly watching fascists, white supremacists, and neo-Nazis battle Black Lives Matter, religious leaders, and antifascists. This lack of action gives rise to claims that the police and local officials were simply not interested in protecting the public from right-wing violence. But the police failures in Charlottesville could have been avoided if the police had cared to learn from past protests. The threat of murderous violence was real and should have been anticipated. In 1979 a similar grouping of white supremacists and fascists opened fire on activists supporting the unionization of mostly black textile workers in Greensboro, North Carolina, less than 200 miles from Charlottesville. They killed five people and wounded several others in what became known as the Greensboro Massacre. Even though the event was well publicized, no police were present. And, despite the fact that live news footage captured the shootings, no one was ever convicted. The local police and city government were found liable in civil court of gross negligence, in part because their own informants had infiltrated the right-wing groups and warned officials of the potential for violence. A flexible and mobile response is needed to deal with roving groups engaged in violent conflicts. In 1991, rioting broke out mostly between Caribbean-American blacks and orthodox Jews in Crown Heights, Brooklyn. The two sides waged several days of pitched battles. The NYPD initially responded by placing officers in riot gear in front of various “sensitive” locations and major intersections. The violence, however, merely moved to other locations, with police left staring at empty sidewalks. The riots were only brought to an end when then Deputy Commissioner Ray Kelly instituted a system of mobile squads that could quickly respond to emerging confrontation, make arrests, and separate groups from each other. One of the lessons from the Ferguson protests of 2014 was that large militarized police formations tend to foment protester anger and leave police flatfooted. While police stood defending some imaginary line, a handful of protesters could run free and set fires and fire weapons. The police then used “less lethal” weaponry, like tear gas, on the more organized groups of protesters—most of whom were opposed to property destruction and violence—escalating tensions and hardening animus toward the police. The Department of Justice made clear that the heavy use of tactical teams, police dogs, snipers, and armored vehicles only inflamed tensions in Ferguson. Police have to be prepared for violence away from official protest areas. During two protests in Berkeley, California, in March and April of this year, there were similar outbreaks of street fighting between right-wing and anti-fascist groups. Police had been deployed to fixed positions in a park in an effort to keep the two groups separated. This plan assumed that the two groups would congregate only in the park with no plan for violence outside the park. This kind of deployment is based on the model of one group staging a stationary protest with a few counter-protesters nearby. 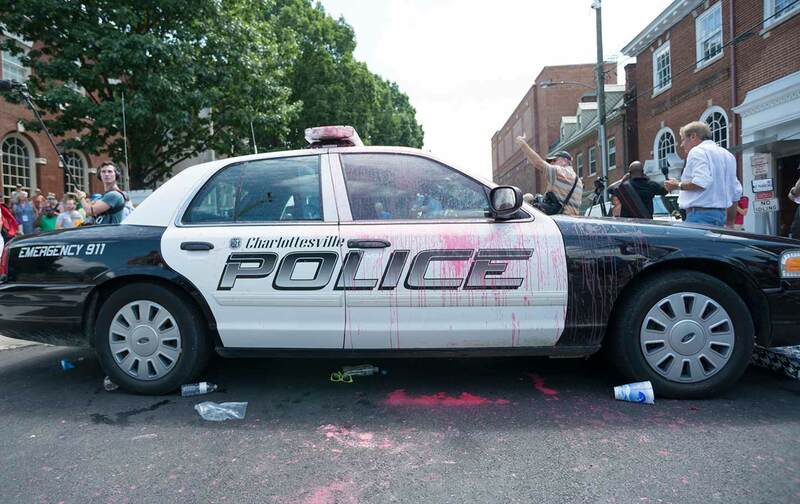 Instead, what we are seeing is an increase in incidents that look more like Greensboro, where groups with deep political antagonisms are mobilizing for a confrontation. In such circumstances, a fixed barricaded position is largely pointless, since groups will simply move somewhere else to fight. In Berkeley, street violence occurred all around the park, rather than in it. Police had no plan to deal with such outbreaks. Officials in Charlottesville should have been prepared for violence outside the park both before, during, and after the scheduled event. Officers should have been deployed in all areas where people would be traveling to and from the march. Mobile teams capable of responding quickly should have been stationed throughout the area. Aggressive traffic control to protect drivers from getting caught in protests and protesters from being run into should have been in place. Police should have intervened early on to confiscate shields, clubs, flagpoles, and other improvised weapons as people began gathering in and traveling to the park. This is standard practice in New York City and other major cities. So called “Oath-Keepers” and other heavily armed militia groups should have been similarly disarmed on the grounds of disorderly conduct or menacing. Their presence did nothing to keep people safe. Police deployed outside the park should have worn regular uniforms and engaged the crowd verbally when possible and with force when necessary, relying on tactical units as a last resort. British police routinely handle contentious protests without weapons or armor, using their visible presence, organization, and numbers to manage crowds. Police in Chicago regularly deploy high-ranking officers into the middle of protest marches in regular uniform to talk to demonstrators. This allows them to gauge the tenor of the protest and reduce tension. Armored vehicles with snipers rarely play any useful role in a protest. They should be held out of sight. Hopefully, police commanders will learn from these recent failures to develop more effective forms of policing that maintain the right to protest, while enhancing public safety. But in the end the outbreak of political violence is a political problem that must be solved through political processes. Policing, no matter how nuanced or sophisticated, can accomplish only so much. When two groups are committed to fighting with each other and the channels of normal politics have broken down, then street fighting becomes more likely and more difficult to manage. It is clear that President Donald Trump and his strategist Steve Bannon have embraced these hate groups and stoked their politics of white resentment. As long as that political reality goes unaddressed, police will be confronted by violent protests. We should also take no comfort from the recent announcement that the FBI would be investigating the events in Charlottesville. The FBI, especially under the current leadership at the White House and Department of Justice, has shown little interest in dealing with threats from white-supremacist, ultra-nationalist, and neo-Nazi groupings. The Southern Poverty Law Center has spent years documenting the dangers posed by these groups, only to receive yawns from federal officials. Just this February the center warned that the Trump administration was excluding white-supremacist groups from further scrutiny as potential “domestic terrorists.” Historically, the FBI has been almost exclusively interested in the transgressions of left-wing groupings. While some investigations of extremist right-wing organizations have occurred in the past, they have rarely resulted in meaningful prosecutions. In contrast, writers like Frank Donner and Tim Weiner have documented decades of far-reaching surveillance and attacks against left-wing groups—this despite the fact that such right-wing groups are tied to the majority of acts of political violence and terrorism in America. If anything, we should expect such an investigation to lead to the harassment of anti-fascist and Black Lives Matter groups, who should be prepared to resist such repression.